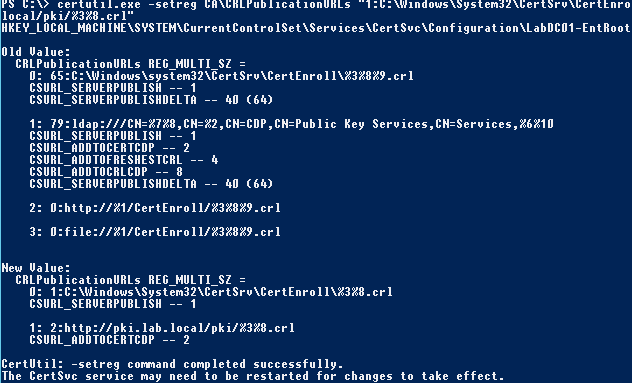 Before installing Active Directory Certificate Services you can create a CAPolicy.inf file that defines certain default values you want the PKI to adhere to. In my case i was strong encryption with long validity so I don’t ever have to worry about replacing anything later. This specifies a key length of 4096 bit (strong) with a 40 year validity period and a 20 year period for Certificate Revocation Lists. Delta CRLs are disabled for simplicity! NOTE: I believe this file is only used if the GUI configuration of the CA is followed. If using PS as below these settings need to be configured manually. I prefer to add features to Windows using PowerShell as it means I don’t have to keep clicking Next every few seconds. The commands I use going forward only work on Windows Server 2012 upwards (sorry). If you are running 2008R2 or older you’ll have to install the roles and features the old way. Also note that the method below requires the server I am installing on be a Domain Controller. Install-AdcsCertificationAuthority -CAType EnterpriseRootCA -KeyLength 4096 -HashAlgorithmName SHA1 -ValidityPeriod Years -ValidityPeriodUnits 40 -CACommonName "LabDC01-EntRootCA" -CADistinguishedNameSuffix "DC=lab,DC=local" -CryptoProviderName "Microsoft Strong Cryptographic Provider"
Remember, you can use the –whatif switch to check that the command is valid and to see what it will do. 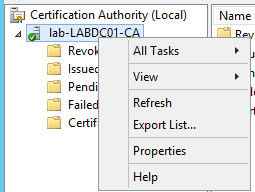 Right clicking on the root server (should have a green tick by it) and selecting Properties and then View Certificate. As an example you should get output similar to the screenshot below if the commands complete successfully. Now, if you check: C:\Windows\System32\CertSrv\CertEnroll You should see your root certificate all present and correct. Now, to be able to issue the correct type of certificates for vCAC (it has very specific requirements according to the docs) we need to create an new Certificate Template. This done by launching the Certificate Authority utility on your issuing CA (In my case this is the Enterprise Root CA installed above). 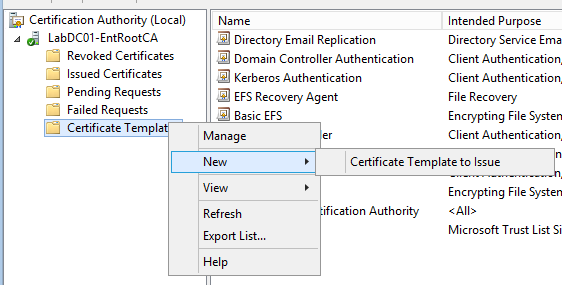 Expand the Certification Authority tree and right click on Certificate Templates. Now select Manage from the context menu. This will open up the Certificate Templates Console. Scroll down the list and select Web Server. Right click and select Duplicate Template. (Shown Below). The properties window will be displayed. 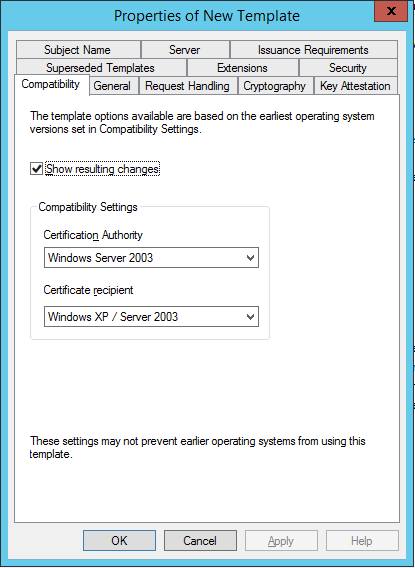 Leave the compatibility level at Windows Server 2003 level and then select the General tab. In the general tab change the information to that shown below. Specifically, make sure the Publish certificate in Active Directory check box is selected and that the validity periods are right for your environment (I don’t want to bother replacing them so have set it long). 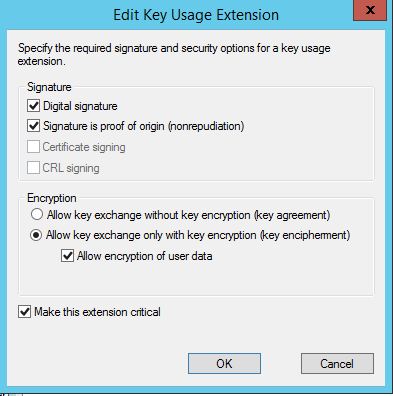 Now select the Extensions tab, select Key Usage and ensure the options shown below are checked. 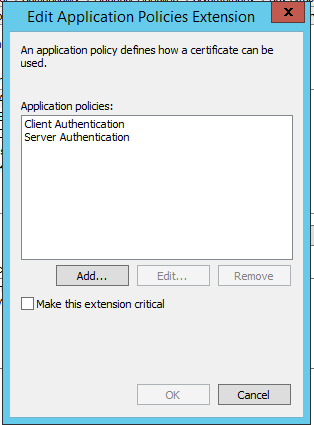 Click OK and then, still in the Extensions tab, select Application Policies and then Edit. 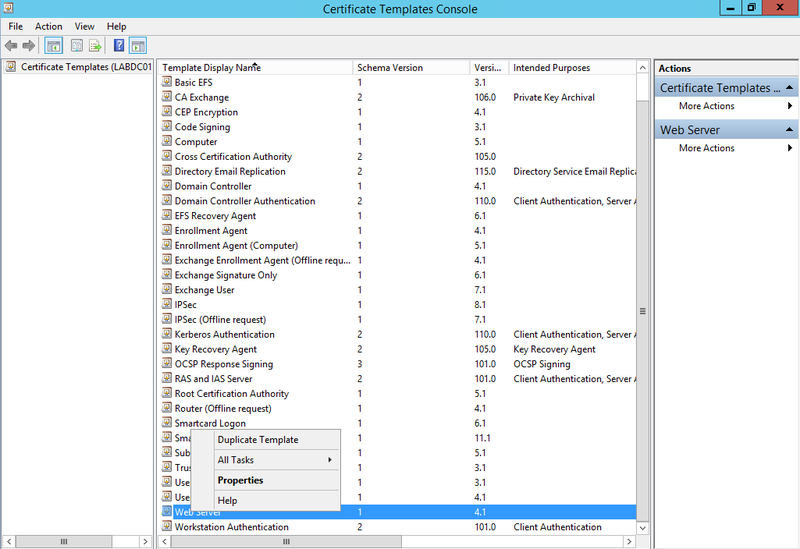 Click add and then select Client Authentication and then OK.
Click OK and close the Certificates Template Console. The certificate is now available in AD and available to publish. Still logged on to your Issuing CA with an account that has Domain Admin privileges open the Certification Authority utility and expand the tree as before. 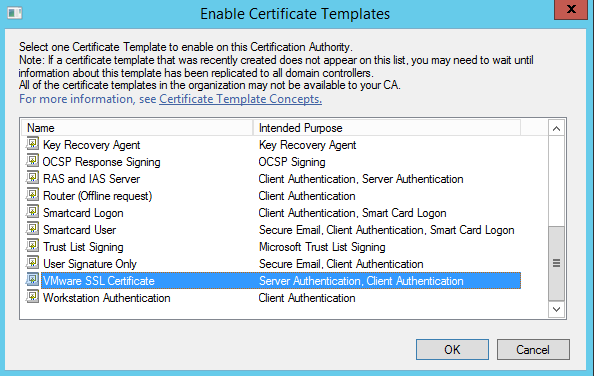 Right click on the Certificate Templates folder and select New > Certificate Template to Issue from the menu. 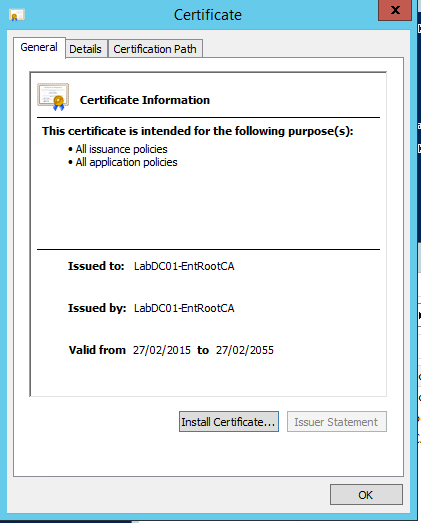 The Enable Certificate Templates window will appear. 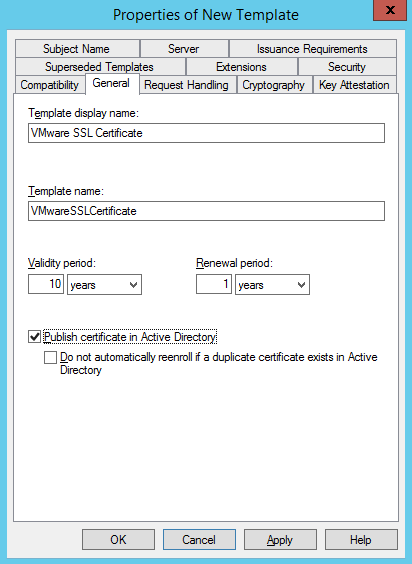 Scroll down and select VMware SSL Certificate as created above and click OK. 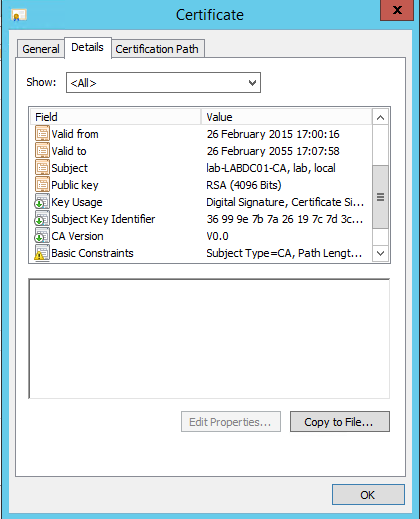 The VMware SSL Certificate should then appear in the Certificate Templates folder.